Keeps everything organized and easy to find when you need it. 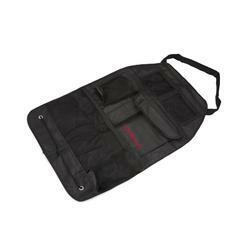 Our seatback organizer does it all with seven full sized pockets and two drink holders in a washable, waterproof fabric. The top fastens around any headrest while the bottom fastens around the seat for a secure fit. Folds for easy storage in seat back pocket when not in use.